We need more social housing at welfare & pension rents and we need it at 58 W. Hastings. That was the message from about 200 Downtown Eastside residents and friends at a Paint-in held on May 21 at the community garden across from Army Navy on Hastings St.
Our Homes Can’t Wait organized the community paint-in, which featured Chinese steam buns and bannock, music by the Carnival band and speeches by local residents who painted the wall of the Portland Hotel which faces the garden. The Paint-in was part of the Our Homes Can’t Wait campaign, which has already been endorsed by groups representing over 100,000 people. 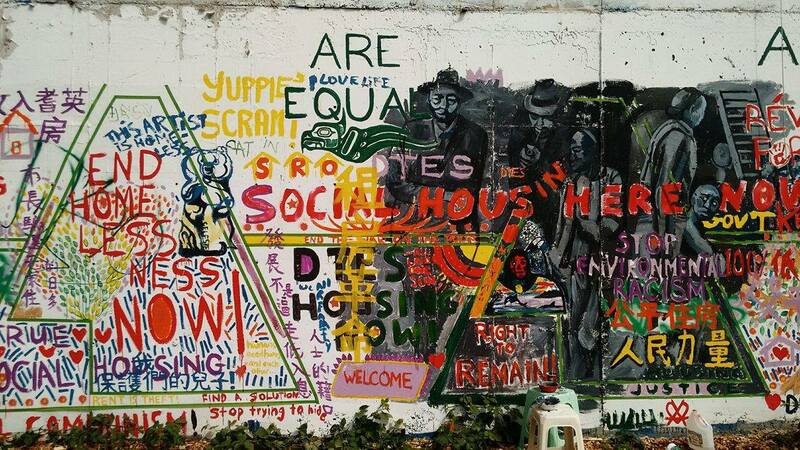 The Campaign calls for governments to build 100% welfare/pension rate housing on 10 city owned sites in the DTES, a rent freeze, preserving and improv- ing the SROs until needed social housing is built, and putting the community vision for housing at 58 W. Hastings in place. Thanks to the Carnival Band, Culture Saves Lives (for letting us use the wall), and to ev- eryone who came out to send the message that we need more social housing at shelter rate!